The letters and borders are inked and some of the panels are more or less ready to ink now. For those of you who wonder, this is made on a Schollenhammer 4G paper, A3 size. (Might be tricky to find that brand nowdays.) 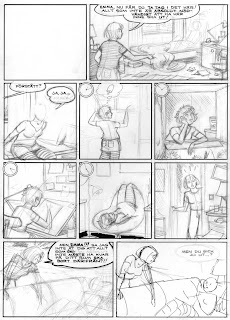 Pencilling is made with a size 0,3 using HB leads. Borders are inked with a Copic Multiliner 1.0 and the lettering is made with a Staedtler pigment liner 0,3.